Everyone deserves to have a home or office that’s clear from rubbish, waste and junk, and if your property is cluttered with unwanted goods then you might find yourself with a lot of wasted space. 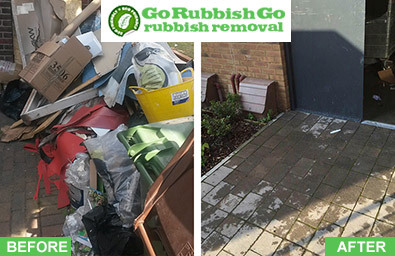 You can ensure that you’re making the most of your living or working space without having to waste your precious free time by giving Go Rubbish Go a call today! 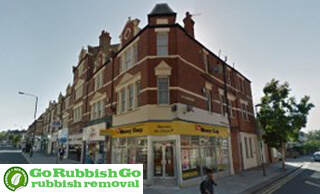 Take advantage of the best waste disposal in N2, Finchley! We offer professional and top-quality Finchley junk removal service and with our assistance you won’t need to worry about your rubbish again! Our fantastic range of services include everything from rubbish collection to furniture disposal, meaning that you can find whatever N2 waste clearance services you might need, without the hassle. We have experienced and friendly team members, as well as many other perks, including cheap rates and flexible service times. Whether you need a hand with clearing your office in N3 or your home in N12, there’s nothing our experts won’t be able to do for you. For the best rubbish clearance help in the area, simply pick up the phone and call us on 020 8610 9182 today! Call Now For The Finchley Rubbish Clearance Company You’ve Been Searching For! 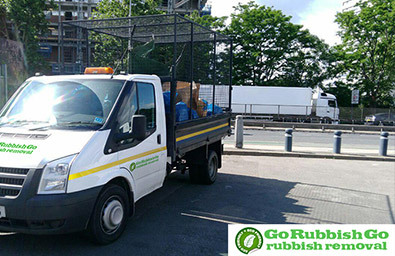 Go Rubbish Go is just waiting to help you with waste disposal, builders waste clearance, office clearance services and much, much more. If you live in Finchley then we have the services that you need, for prices that you’ll love! We have some of the cheapest rates in the N2 postcode area, and with no hidden fees to surprise you with, and with free price quotes available, hiring our Finchley rubbish clearance company is a decision that you won’t regret! Would gladly hire them again! Cleared out my entire garage in N2 in just two hours. Next time I need a fast and reliable waste removal in N2, Finchley, I’ll know who to call. Get Professional N2 Rubbish Clearance Help! Hire us Today! We’ll easily fit into your busy schedule with our flexible service hours and speedy and efficient services, and we’ll provide you with the home clearance teams that will save you hours of time and effort. We won’t just collect your rubbish, but we’ll dispose of it using green methods too, ensuring that you won’t need to get your hands dirty to get the spacious home that you deserve. We’ll provide you with experienced, talented and dedicated experts who’ll make quick work of your clearing needs, no matter how big a job you might have on your hands, and with guaranteed rubbish removal Finchley services that you’re sure to be impressed with, you won’t be disappointed! If you live in the N3 or N12 area then call us now on 020 8610 9182! One of the reasons why we’ve enjoyed so much success over the years as a company is due to the knowledge and dedication of the team we send out to take care of our customers’ jobs. Our employees are hard working and have skills and experience. They are driven to make your life that little bit easier and your home that little bit cleaner. Having undergone a substantial amount of training beforehand and having many years of on the job experience when dealing with call outs, our rubbish disposal N2 team have experienced it all. You will be get the best waste removal Finchley, N2 service completed by the best team in business. Finchley is an area found in north London, eleven miles from Charing Cross, and is a part of the London Borough of Barnet. Finchley is comprised of East, West, North Finchley and Finchley Central. There are lots of interesting landmarks to be discovered in the area, including St Marys Church, which dates back to the 13th century, as well as College Farm, the last farm in the area and which is now a tourist attraction. One of the UK’s oldest purpose-built cinemas can also be seen here – the Phoenix Cinema has beautiful 1930s décor and is found in East Finchley. There are four Underground Tube stations which serve Finchley: East Finchley, Finchley Central, Woodside Park and West Finchley, all of which make travel easy and reliable. There are also many bus services, and two of London’s A roads also run through the area, making travelling by car just as dependable.